Thanks to the growing popularity of AirPlay, and wireless speakers from the likes of Sonos, multi-room audio is finding its way into an increasing number of homes. 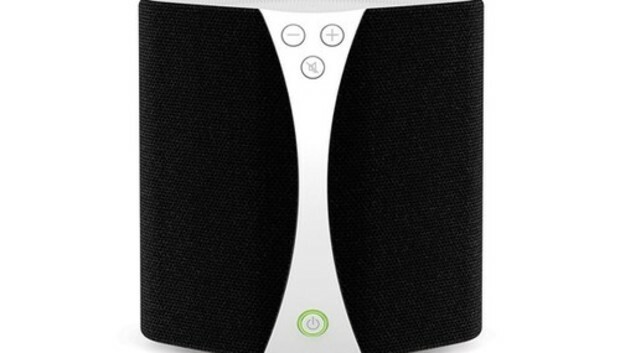 Pure, a company largely known for its Internet-radio and iPod/iPhone-dock products, is a relative newcomer to this business with its Jongo wireless speakers. While I've listened to a number of Jongo products, I focus here on the most flexible model of the family, the the $200 Jongo S3. In terms of connectivity, you can stream music to the S3 via Wi-Fi or Bluetooth (the latter requires an included Bluetooth dongle that jacks into a USB port on the back of the speaker). The S3 also includes an auxiliary-input jack for directly connecting an external audio source such as an iPod. Inside the S3 you find a small amplifier, four .75-inch tweeters (two in front and two in back), and a single 3.5-inch upward-facing speaker that handles the low and midrange frequencies. The front of the speaker features volume up and down buttons along with a mute button. You can create a stereo pair if your have two S3s--one plays the left channel and the other the right. Alternatively, you can stream the same music to multiple Jongo units on the same Wi-Fi network. However, unlike with a Sonos system, you can't stream different music to different units within the same group. If you want to play classical music in the living room and rap in the rumpus room, you have to use a different source for each--your iPad for one room and an iPhone or Android device for the other, for example. To test the S3, I connected my iPad Air to the unit via both Bluetooth and Wi-Fi. Of the two, Bluetooth is the easiest to set up: I simply pressed the S3's power button, switched on Bluetooth on the iPad, waited for the S3 to appear in the list of Bluetooth devices on the iPad, and then tapped that name. The speaker paired with the iPad and then became available as an audio destination. Creating a Wi-Fi connection, however, was more convoluted. Unfortunately, the S3 doesn't support AirPlay, so I began by downloading a copy of the free Pure Connect app. Then I switched on the S3, pressed the Wi-Fi button on the back, and waited for the power button to flash yellow. Next, I accessed the Wi-Fi settings screen on the iPad and tapped the S3's name when it appeared. (The S3 created its own Wi-Fi network for this setup procedure; this step joined my iPad to that network.) This launched a setup screen where I chose the Wi-Fi network I actually wanted to use with the speaker. Once I set that up properly, the iPad reverted to the original Wi-Fi network it was using before I started all this. Finally, within the Pure Connect app, I tapped a button to switch on the Jongo unit(s) I wanted to stream to. Thankfully, you have to do this for only the first S3 unit you configure. To add another S3, you just press and hold the Wi-Fi button on any already connected unit until its power light flashes green, and then press and hold the Wi-Fi button on the unit you're adding until its power light pulses green. When both lights show a steady green, that means the second unit has joined the party. If there's a weak link in this chain--besides, for iOS users, the lack of AirPlay--it's the requirement to go through the Pure Connect app when connected via Wi-Fi. Unlike with AirPlay and Bluetooth, you can't stream all your device's audio over Wi-Fi. Rather, you're limited to the audio that the Pure Connect app can handle: music files stored on the device, Internet radio stations, compatible music files stored on DLNA servers on the same network, and Pure's Pure Connect music-subscription service ($5 a month for streaming only, $10 to add offline playback). There's no way, for example, to play audio from popular music services such as Pandora or Spotify. The alternative is to switch to a Bluetooth connection, which allows you to stream anything, but you're then constrained by Bluetooth's 30-foot range between the broadcasting device and the speaker. The S3 has four speaker profiles: Mono 360°, Outdoor Boost, Stereo 360° (where the four small speakers play left and right audio and the larger speaker acts as the "subwoofer"), and Stereo Forward Facing (the front two speakers speakers play along with the larger speaker). These settings can be toggled only by pressing the Audio button on the back of the speaker. It would be nice if you could switch between profiles using the Pure Connect app. Quite honestly, I didn't hear a startling difference between the profiles when sitting in front of the speaker. With such a small enclosure, there's virtually no stereo separation, so you shouldn't expect miracles when switching from stereo to mono. However, if you've placed the speaker in the middle of a room with no obstructions around it and you're standing behind the speaker, switching on the rear tweeters does make a difference. The S3 is not a speaker that sounds its best when cranked up to loud volume levels. Take it to its upper volume limit, and it sounds like a small speaker tasked with too much to do--the lower midrange takes over and things get muddy. At low-to-moderate volumes, it still sounds like a small speaker, but one that isn't trying too hard. Audio quality also doesn't improve noticeably when you create a stereo pair of S3 units. Audio is still small and a bit boxy. The Jongo S3's primary advantage is that it can be used just about anywhere, thanks to three connection methods, portable size, and battery power. But as part of a multi-room music system, it can't compete with the similarly priced Sonos Play 1, which sounds better and can be part of a system that has access to all the major music services over Wi-Fi, can access all the music in your home library, and can stream different music to different speakers on its network. If multi-room music is your ultimate goal, go with Sonos. If, instead, you're after a portable and flexible speaker (or two) that's at home inside or out, your best bet is to audition the S3 along with a few other Bluetooth speakers in its price range.